Maitri’s vision is to work towards a world in which each lives with Identity, Dignity, and Respect. Your donations will help us achieve that dream. 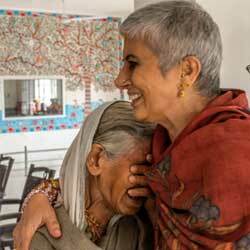 Your donation to Maitri will have a direct positive influence on the health and happiness of widow mothers. The love and charity of your donation will help us support the widow mothers with the dignity and respect they deserve. 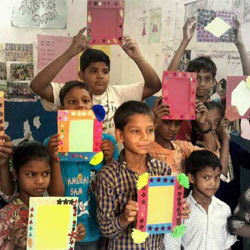 It will help is provide holistic educational support to underprivileged children. Thank you again for choosing Maitri. Please accept our deepest gratitude for your time. Ways to give : You can make a donation in three simple ways. You can also make a direct payment through bank. “As a child needs love and a roof over his head, so does every mother. A mother needs a home where she can live with Identity, Dignity and Respect”. When you adopt a Widow Mother, you achieve a special kind of Giving that creates a relationship between you and the widow mother at Maitrighar. Adopting a mother means, you are taking care of her wellness and wellbeing. It gives you the opportunity to witness lives transformed from struggle and abandonment to survival and acceptance with love. When you sponsor a Widow Mother, two lives are changed: a Mothers’ and yours! We shall keep you updated on the mother. Support Maitri in providing a safe and secure home to widow mothers where they can live with dignity and get nutritious meals including fruits and milk, clothing, emotional and mental wellbeing, and provided with healthcare. Donate Rs.20, 000 / USD 300 for one widow mother for a year. overall sense of wellbeing, self worth and belonging improves. This helps in promoting stronger social bonds, participation and solidarity among widow mothers.This also helps in actively ageing and improving their mobility and strength. Support the initiative. being alone, abandoned or due to lack of close family ties and reduced connections with their culture of origin, which results in an inability to actively participate in the community activities. With advancing age and circumstances, it is inevitable that widow mothers in Vrindavan lose connection with their roots, sometimes family and their communities. Come celebrate your special days or visit and meet our widow mothers and foster stronger connections. Your support will help in strengthening emotional, physical and mental well being of widow mothers. Celebrate yours and Your parents/ childrens, special days like birthdays, wedding anniversary etc by sponsoring a special meal. 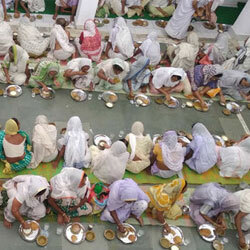 ( Celebrated with bhajan singing, prayers and blessings) We welcome you to come and serve food yourself that day, if possible. 60 years . 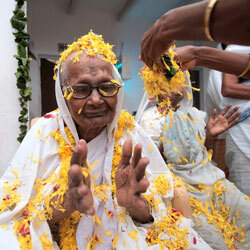 Our oldest is 105 years old, and we have Renu Ma with the most angelic smile who is 99 years old this year. Majority is suffering from age related sicknesses and neglect by family. Unfortunately, we have found, till they came to Maitri, their health needs had not been met, neglected and they were not seeking healthcare because they did not know how to access health care. Maitri provides them with timely healthcare, medicines that are prescribed and health supplements. Maitri has successfully facilitated 63 cataract surgeries for widow mothers living in MaitriGhar, who were advised surgery in 2017-2018. Dental Health is facilitated by Maitri for all its beneficiaries in Vrindavan, including dentures and tooth removal. Widows are taken to the hospital for all health needs including blood tests, X-rays and scans etc ,medical referrals and procedures. Doctor visits MaitriGhar, ashram and Old Age Home twice a week and on call . 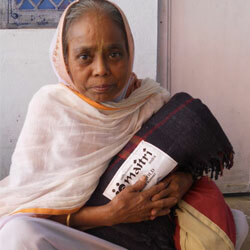 Medical and health care is a central feature of what Maitri does for its beneficiaries. 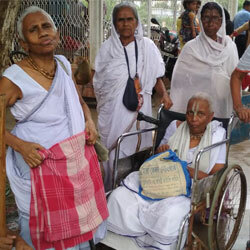 The health of a mothers (maiya, as they are lovingly called) is of paramount importance. Your support will ensure a healthy mother. Most widows experience loneliness and depression in old age, either as a result of being alone, abandoned or due to lack of close family ties and reduced connections with their culture of origin, which results in an inability to actively participate in the community activities. 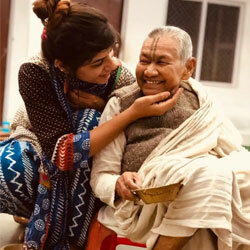 With advancing age and circumstances, it is inevitable that widow mothers in Vrindavan lose connection with their roots, sometimes family and their communities. Come celebrate your special days or visit and meet our widow mothers and foster stronger connections. Your support will help in strengthening emotional, physical and mental well being of widow mothers. You can celebrate the day by Remembering parents or a close friend to the chants of the bhajans for prayers and blessings and by Sponsor a special lunch for all widow mothers. Active ageing is the process of optimizing opportunities for better health, quality of life, as people age. Most Widow mothers have faced isolation, discrimination and abandonment, from family and society. Widowhood translates into exclusion and isolation from society. 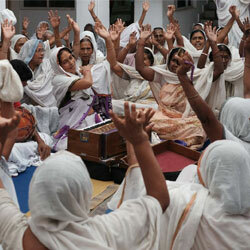 Celebrations of festivals like holi, diwali etc will help widows break taboos and actively participate. Support Maitri in creating opportunities for participation, social bonds, skill building, income generation activities, kirtan, yoga and meditation, which can improve the quality of their life. You can join hands with Maitri and the widow mothers in celebrating Holi. Maitri celebrates Holi with widow mothers of Vrindavan and Radhakund to improve participation and social bonds of widow mothers. 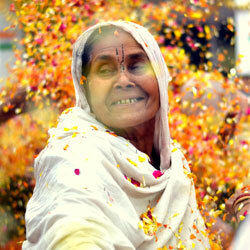 The celebrations are unique as widow mothers play Holi with flowers & colours to the beat of drums dancing with joy. A unique way of putting “tilak” on the for ehead adds to the festive. Come celebrate Holi with us. Most Widow mothers have faced isolation, discrimination and abandonment, from family and society. Widowhood translates into exclusion and isolation from society. 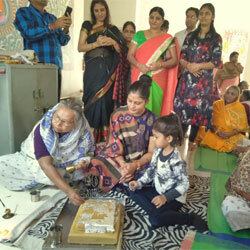 Celebrations of festivals like holi, diwali etc will help widows break taboos and actively participat e. Support Maitri in creating opportunities for participation, social bonds, skill building, income generation activities, kirtan, yoga and meditation, which can improve the quality of their life. You can join hands with Maitri and the widow mothers in celebrating Diwali. At Diwali, the mothers create artwork, with indigenous colors, and decorate the whole ashram with earthen lamps. 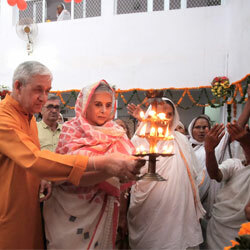 (Festival of Lights, signifies light in their life). Active ageing is the process of optimizing opportunities for better health, quality of life, as people age. Most Widow mothers have faced isolation, discrimination and abandonment, from family and society. Support Maitri in creating opportunities for participation, mobility, skill building, income generation activities, kirtan,yoga and meditation, which can improve the quality of their life. You can join hands with Maitri and the widow mothers by Supporting visits to religious places like Haridawar, Varanasi, for widow mothers as build self confidence and self worth. It also helps in improving their mobility and self-confidence. You can help us provide sarees, blankets and warm clothes for winter. When the cold winter months approach, many do not even have warm blankets and clothing. At an older age and among the elderly, the danger of exposure to cold is particularly high, and even with a mild drop in environmental temperature, there is already a risk of reduced body temperature; blood vessels tend to constrict, making it more difficult for oxygen to reach the entire body. Most widow mothers face constant colds and aching bones. “Imagine a child walks up to the rack and chooses a book, a book that perhaps Reflects their own life, or perhaps of experiences and things that they have never imagined before, a book in their own language or a book in a language they are trying to learn, a book that has colors and patterns, a book they would want to feature in, a book they would want to read” There is never an end, It’s a gift you can open again and again. You gift a book; you gift a friend to a child. 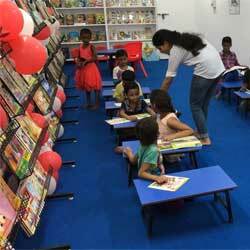 Support us to bring dream closer to our young minds and let them discover a world waiting to be discovered through books. Sponsor a Book, Gift a Book. Every child deserves a strong start – the best chance for a successful future. But too many children do not get the opportunity to even reach middle school forget reach their full potential. You can help change that. If you sponsor a child, You give the the child a gift of life, a gift of a brighter future. When you sponsor a child, you achieve a special kind of giving that creates a relationship between you and the child. Sponsorship provides not only financial support for education but also ensures lesser chances of the child dropping out of the education system. It gives you the opportunity to witness young lives transformed for the future. When you sponsor a child, two lives are changed: a child’s and yours! Your support enable us to provide the right help at the right time. Shower your love and support. 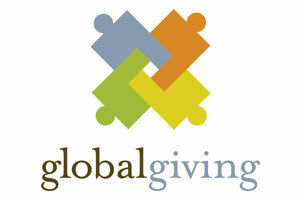 3. donate through Global Giving, Give India. 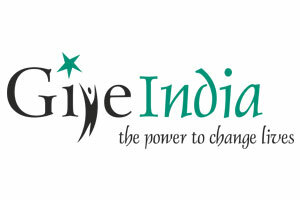 4. donate direct payment in bank. Beneficiary Bank Name: Axis Bank Ltd.
yourself in the service of others. "